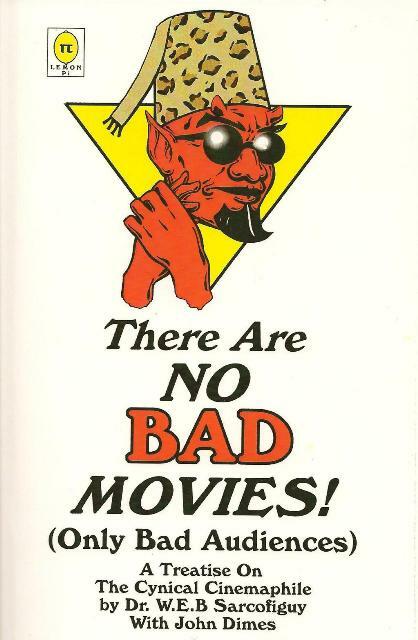 “THERE ARE NO BAD MOVIES (ONLY BAD AUDIENCES)” – A Book Review! Welcome to the first book review featured on TERROR FROM BEYOND THE DAVES. I’ve got a great selection that successfully ties our site’s two main elements together: horror hosts and movies! So, without further adieu, I’d like to introduce “THERE ARE NO BAD MOVIES (ONLY BAD AUDIENCES)”. This book is written by John Dimes, though horror host fans may know him better as Dr. Sarcofiguy. While acquiring information from John for our weekly horror host update (which I am not ashamed to admit that I am very proud of), I mentioned also doing a review of his book. He delighted me by not only agreeing but by also sending me a free copy. I was very touched by his generosity and it illustrated to me what a genuinely classy and generous man he is. I will be honest, I had no idea what to expect when I started to read this book. For some reason I thought it was going to be about his take on the whole genre of z-grade horror movies. In other words, movies that rely on horror hosts to make them even remotely watchable, which in John’s case, is his show SPOOKY MOVIE TELEVISION. I couldn’t have been more wrong! John’s knowledge of film is quite vast and his book covers a wide, eclectic range of genres. My first impression of the book was in regards to his actual writing style. I have seen Dr. Sarcofiguy speak both on his television shows as well as during documentary interviews. I was pleasantly surprised to see that he writes just like he talks. This gives the reader the impression that John is actually having a private conversation with them…the essence of good story telling. The second thing I really liked was his overall opinion on how movies should be viewed…don’t just watch it, ENJOY IT!!! The whole experience!!! Of course everyone has their favorite types of movies. The problem is that most people are closed-minded with this and refuse to watch, or enjoy, any other type of movie other than their favorites. I am very guilty of this myself and I didn’t realize how bad I was until I read this book. John…thanks for opening my eyes. I think if you read this book, and really think about what John is saying, it will open your eyes to a lot of things…and alot more types of movies to watch and enjoy. One of the most entertaining aspects of the book is when John discusses movie reviewers, which has always been a pet peeve of mine. Movie reviewers are supposed to be objective when they review films, but it is so obvious that they are not (which is why movies are all over the place when the reviews come out). It is funny how John points out that some reviewers just don’t get it. An example he gives is for a person who reviewed the movie THE LORD OF THE RINGS. In his review he wondered “whether anyone believed in hair care products, or conditioner in Middle Earth.” John’s hilarious response was, “WHAT THE HELL DID THAT HAVE TO DO WITH THE MOVIE?!! !” And he is right! Why would a movie reviewer even mention that? I could go into details of more subjects that John goes through, but that would defeat the purpose of you going out and buying the book. I will say this…if you are a movie fan, and love a wide variety of movies, then this is a great read. It is also a quick read which is nice, since so many people these days don’t seem to have the time to sit down and read a good book. If you would like to order a copy (and you know you do), you can order it here. 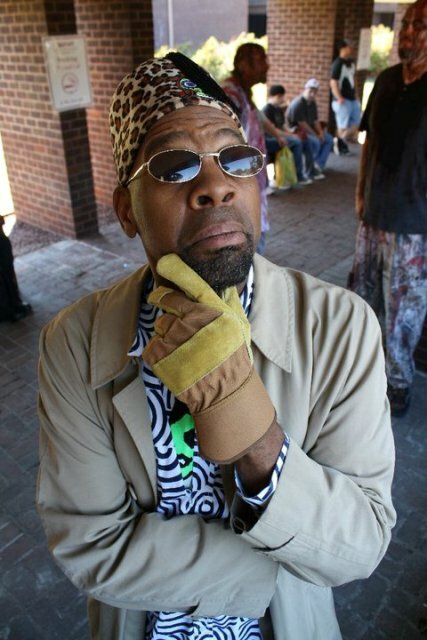 If you would like to learn more about John Dimes, aka Dr. Sarcofiguy you can visit his website or his blog! This entry was posted in Book Reviews, Horror Hosts and tagged Dr. W.E.B. Sarcofiguy, Spooky Movie Television, The Lord of the Rings. Bookmark the permalink. ← Ode to the Horror Host Sidekick: Interview with Penny Dreadful’s Garou!